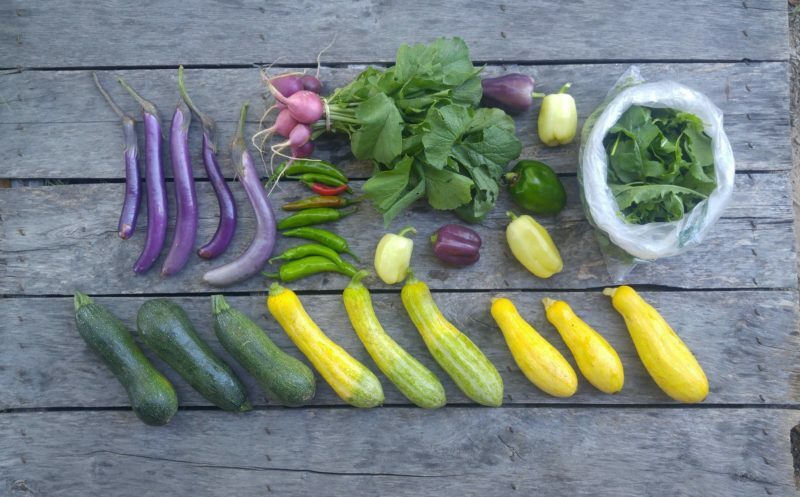 Welcome to your FIRST share of the Fall CSA! Thank you guys so much for partnering with us this growing season. We have loads of great crops in store for you over the next couple of months. The first several weeks (until frost) we should be harvesting everything that’s held out from the summer garden (eggplant, peppers, basil, jalapeños, okra, onions, and possibly even a few straggling summer tomatoes… plus we planted late season zucchini, squash, cucumbers, beans, AND even more fall tomatoes for you.) Gradually over the next month, more and more of the fall crops will ripen and your shares will look less like summer and more like fall. Already the quickest growing fall crops are just beginning to mature. The beginning and ending shares of each season are typically a bit smaller than the rest, as crops are either coming in or waning. Expect each week to be a bit different in quantity, and in diversity. Each week come back to this blog to see the share notes and learn all about the contents of your share. Should be a great season. We hope you enjoy every bit! Arugula—Large shares. This first young planting is peppery and tender. We like our arugula salad with lots of sweet red and orange peppers, feta, and pine nuts. Spring Mix—Small shares. This mix of Asian greens is super flavorful, perfect for salads of for cooking. Bell Peppers—We grow a huge array of colors, and each color has a slightly different flavor. Red and orange will be the sweetest, white, purple, or green will all taste more like your standard green bell pepper. Radish—Easter Egg variety for the large shares, French Breakfast for the small shares. Try them roasted from this recipe. Did you know radish greens are edible? And right now they’re super tender and delicious. Cayenne—a handful of small, super spicy cayenne peppers. These should be one or two ticks hotter than a jalapeño, but not as hot as habaneros. Zucchini—Tigris variety is so lovely, tender, and flavorful. Squash—Everyone received both yellow squash and our super interesting Zephyr variety, which is green on one end, yellow on the other. Super unique! Let us know what you think. Eggplant—Large shares received Japanese eggplant and depending on how the grow, we hope to have some for the small shares next week. Are you new to eggplant? Here are some tips: You don’t have to peel or sweat the slender Japanese types like you do the Italian varieties. a quick cook at high heat is wonderful for eggplant, charring and sweetening it without it becoming mushy. This summer we’ve been enjoying a North Indian eggplant dish, or boosting the nutrition in our pasta sauces with fine diced eggplant and bell peppers. It’s a GREAT way to get your kiddos to consume more veggies. The squash, zucchini, hot peppers, and the sweet peppers can be stored at room temp for a few days, or they’ll last at least a week in the fridge. Eggplant will keep longest stored in the fridge sealed up in a bag. This variety of eggplant doesn’t last long, so plan to use it up soon. Arugula and Spring Mix will want to be kept really cold. Make sure they’re sealed up so they don’t get wilty. Radishes should be severed from their tops to keep the roots from getting rubbery, then sealed up in the fridge to stay crisp. The radish tops can be stored like other greens. Everything will need a significant washing before cooking, but leave the dirt on until you’re ready to use them to prevent faster spoilage. Large Share: (top left to right) Japanese eggplant, Easter Egg Radishes, bell peppers, bagged arugula, Cayenne peppers in a column in the middle of the photo. (From left to right across the bottom) zucchini, Zephyr zquash, yellow squash. 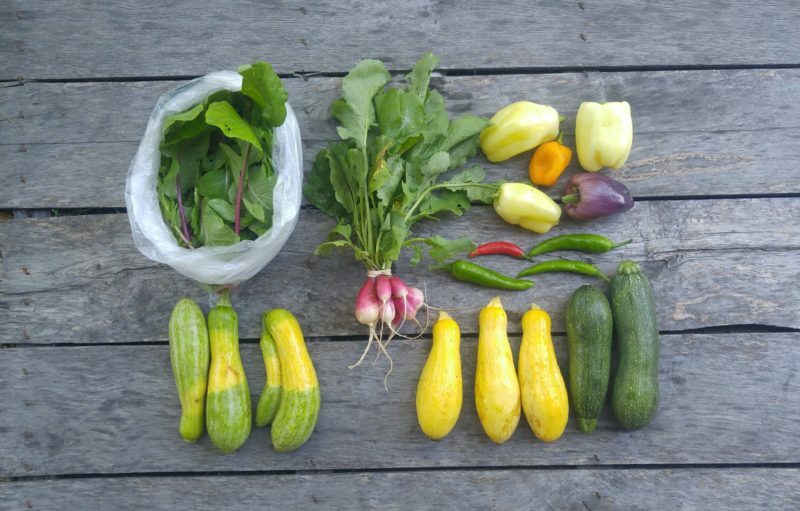 Small share: (top left to right) bagged spring mix, French Breakfast radishes, bell peppers, cayenne peppers below the bells, (bottom row) Zephyr squash, yellow squash, and zucchini. I chopped up the eggplants and put them in our chili! It was delicious! Used the cayenne peppers and bell peppers in there too! Thanks! That’s great! Sounds so tasty.